How are you feeling about pumpkin recipes, are you still in love with them? Good, me too! I have another pumpkin treat for you to add to your collection and this time it’s in drink form! 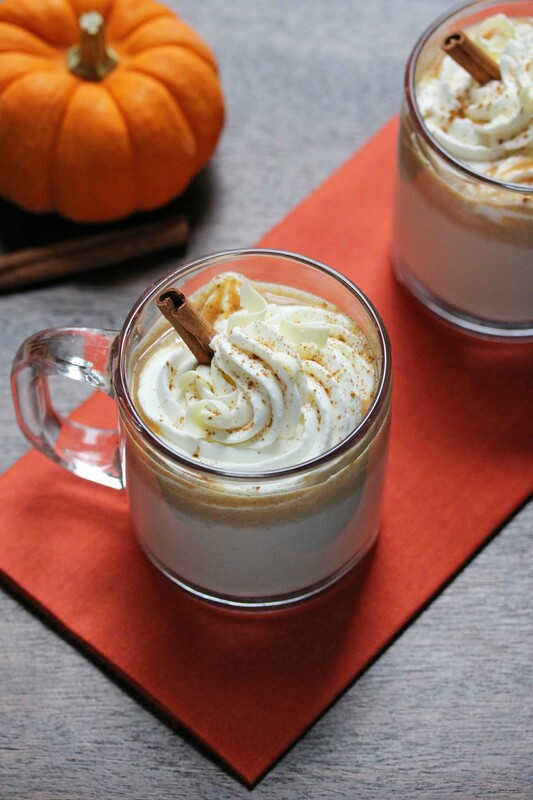 So without further ado, say hello to this pumpkin spice hot white chocolate! A warm, rich and creamy white hot chocolate with hints of pumpkin and warm spices. Topped with whipped cream, cinnamon and white chocolate shavings, I like to go all out when it comes to hot chocolate! The perfect way to warm up for the cold weather ahead…too soon? Heat the milk, pumpkin puree, cinnamon, ginger and cloves in a medium sauce pan over medium low heat. Whisking occasionally until the milk mixture starts to simmer. Do not bring the milk to a boil. Add the chopped white chocolate and whisk until melted. Remove from the heat and serve. Garnish with whipped cream, a sprinkle of cinnamon and a few white chocolate shavings and enjoy! 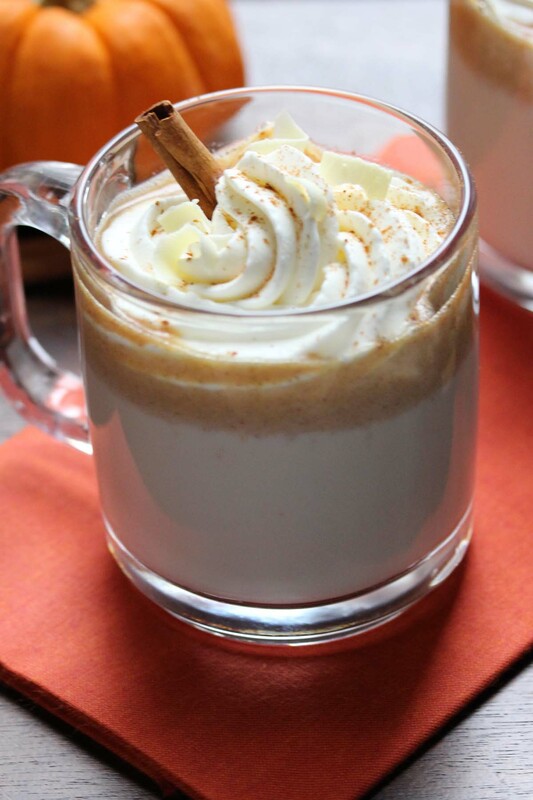 8 Responses to "Pumpkin Spice Hot White Chocolate"
This looks like the perfect fall drink! I love pumpkin in warm drinks and this one sounds delicious. I was actually looking for a hot pumpkin drink recipe and I think I found it! Looks great and will try it later today, while I’m experimenting with a pumpkin bread recipe! I don’t think I’ll ever get sick of pumpkin recipes! This hot chocolate is on my list of recipes to make. Isn’t it delicious? I will have to try out your version. So perfect for the fall! I don’t think you can ever have too many pumpkin recipes. Love that you made a hot white chocolate drink with it too. Great idea! Looks incredible Ashley! 🙂 Perfect fall treat, yum! Beautiful pictures too. I will never not be in love with pumpkin recipes (especially when they look like this)! This sounds perfect to keep us warmed up. I will try this! Great pictures!